Japan has produced a number of distinguished progressive-oriented rock groups over the past thirty years or so, including the Far East Family Band, Chronicle, Stomu Yamashta and Yellow Magic Orchestra. Unfortunately, it’s doubtful that Kalo will ever be included among them. For one thing, this is a group desperately in search of an identity. 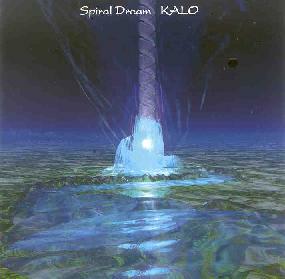 There’s much impressive playing throughout this disc, and there’s certainly no lack of artistic technique among the trio that make up Kalo. Structurally, the compositions (twelve in all) are well-arranged, and the obligatory guitar and keyboard soloing is generally tasteful and only occasionally goes too far over the top. The glaring weakness on Spiral Dream is the lack of any discernible musical direction, and while some may call this enlightened eclecticism, this inability on the part of the group to identify any kind of coherent musical goal to strive toward results in a languorous—though admittedly pleasant—aimlessness. “Dharani,” for instance, tries too hard to showcase the group’s obviously impressive chops, and consequently ends up sounding like a bad imitation of the kind of technical progressive metal that Dream Theatre is far more adept at. To the other extreme, songs like “Gleam” and the title track could almost be called new age. Kalo slips chameleon-like into as many more genre disguises as is humanly possible on this album, everything from classic 70s prog rock to jazz fusion to Vangelis-inspired symphonic electronics to the occasional guitar/bass/drums thrash, albeit with the appropriate savoir faire of high tech flash. After almost an hour of listening to Spiral Dream, one gets the distinct impression that while there’s an abundance of costume jewelry glitter here, there’s simply not much heat or fire beneath the icy gleam of the sparkling textures that make up the bulk of these compositions.